The Lifetime Achievement Award is bestowed upon a person who has exhibited high standards of character and ethics and who is held in the greatest esteem by peers and fellow members of the jewelry industry. 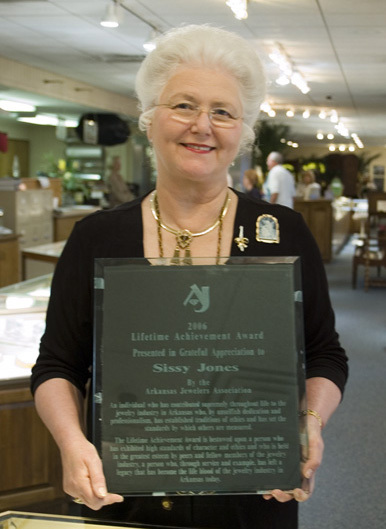 An individual who has contributed supremely throughout life to the jewelry industry in Arkansas who, by unselfish dedication and professionalism, has established traditions of ethics and has set the standards by which others are measured. 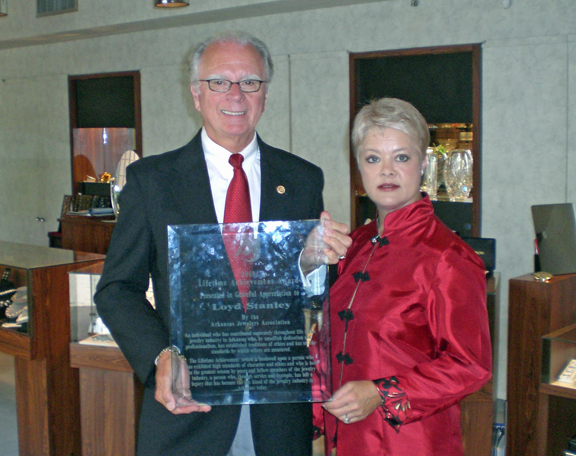 a person who, through service and example, has left a legacy that has become the life blood of the jewelry industry in Arkansas today. Doug is a Certified Gemologist with the American Gem Society and is a graduate of the Texas Institute of Gemology. He brought ten years of experience to Overstreet’s when he joined the store in 1994. You have heard him on the radio for 40 years…that voice…Loyd Stanley remembers the days when he was the son; now he’s the father. Since about 1957, he has devoted his days to giving the highest service and quality possible. He sets a standard for treating every customer like his very best customer. His reputation is well deserved and he appreciates your business. These days you may find him in the store, but more likely you will hear, “He’s golfing,” “He’s skiing,” “He’s at the lake,” “He’s playing in a bridge tournament,” ….the list goes on. Ski trip 648 is on the calendar in January 2015. T.C. is the Co-Owner of Carter's Jewel Chest, an AWI Certified Master Watchmaker, and a JA Senior Jewelry Management Professional. He is a graduate of Gem City College, Quincy, Illinois. T.C. has 43 years total experience with 36 years at CJC. He was born in St. Mary's, GA, and some of his hobbies include: boating, hunting, flying, diving, family, and grandsons. © 2017 Arkansas Jewelers Assocation. All rights reserved.